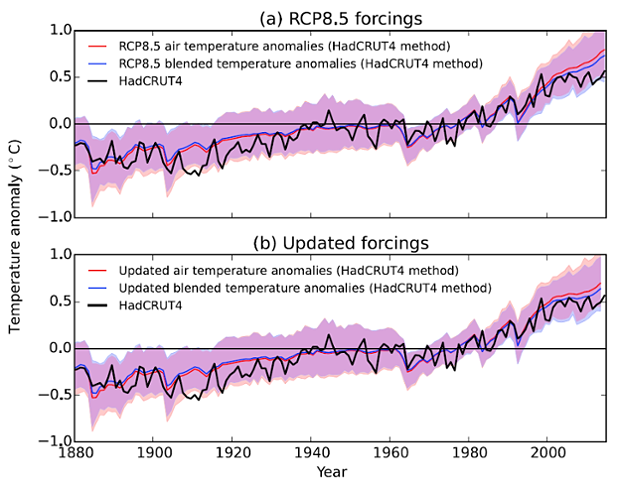 Comparison of 84 climate model simulations (using RCP8.5) against HadCRUT4 observations (black), using either air temperatures (red line and shading) or blended temperatures using the HadCRUT4 method (blue line and shading). The upper panel shows anomalies derived from the unmodified climate model results, the lower shows the results adjusted to include the effect of updated forcings from Schmidt et al. (2014). Global climate models aren’t given nearly enough credit for their accurate global temperature change projections. As the 2014 IPCC report showed, observed global surface temperature changes have been within the range of climate model simulations. Now a new study shows that the models were even more accurate than previously thought. In previous evaluations like the one done by the IPCC, climate model simulations of global surface air temperature were compared to global surface temperature observational records like HadCRUT4. However, over the oceans, HadCRUT4 uses sea surface temperatures rather than air temperatures. Thus looking at modeled air temperatures and HadCRUT4 observations isn’t quite an apples-to-apples comparison for the oceans. As it turns out, sea surface temperatures haven’t been warming fast as marine air temperatures, so this comparison introduces a bias that makes the observations look cooler than the model simulations. In reality, the comparisons weren’t quite correct. We have highlighted the fact that the planet does not warm uniformly. Air temperatures warm faster than the oceans, air temperatures over land warm faster than global air temperatures. When you put a number on global warming, that number always depends on what you are measuring. And when you do a comparison, you need to ensure you are comparing the same things. The model projections have generally reported global air temperatures. That’s quite helpful, because we generally live in the air rather than the water. The observations, by mixing air and water temperatures, are expected to slightly underestimate the warming of the atmosphere. The new study addresses this problem by instead blending the modeled air temperatures over land with the modeled sea surface temperatures to allow for an apples-to-apples comparison. The authors also identified another challenging issue for these model-data comparisons in the Arctic. Over sea ice, surface air temperature measurements are used, but for open ocean, sea surface temperatures are used. As co-author Michael Mann notes, as Arctic sea ice continues to melt away, this is another factor that accurate model-data comparisons must account for. One key complication that arises is that the observations typically extrapolate land temperatures over sea ice covered regions since the sea surface temperature is not accessible in that case. But the distribution of sea ice changes seasonally, and there is a long-term trend toward decreasing sea ice in many regions. So the observations actually represent a moving target. When accounting for these factors, the study finds that the difference between observed and modeled temperatures since 1975 is smaller than previously believed. The models had projected a 0.226°C per decade global surface air warming trend for 1975–2014 (and 0.212°C per decade over the geographic area covered by the HadCRUT4 record). 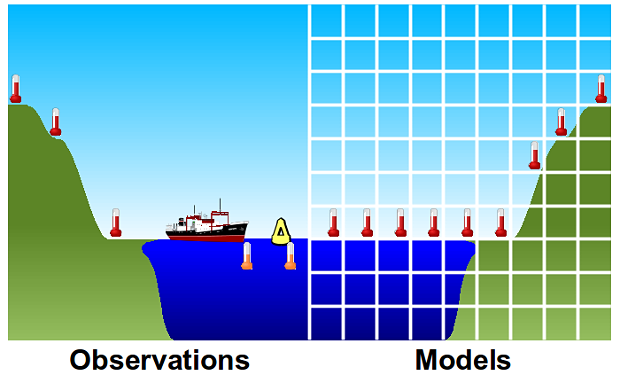 However, when matching the HadCRUT4 methods for measuring sea surface temperatures, the modeled trend is reduced to 0.196°C per decade. The observed HadCRUT4 trend is 0.170°C per decade. When doing an apples-to-apples comparison, the difference between modeled global temperature simulations and observations is 38% smaller than previous estimates. As noted in a 2014 paper led by NASA GISS director Gavin Schmidt, less energy from the sun has reached the Earth’s surface than anticipated in these model simulations, both because solar activity declined more than expected, and volcanic activity was higher than expected. Ed Hawkins, another co-author of this study, wrote about this effect. The level of agreement between climate model simulations and observed surface temperature change is a topic of scientific and policy concern. While the Earth system continues to accumulate energy due to anthropogenic and other radiative forcings, estimates of recent surface temperature evolution fall at the lower end of climate model projections. Global mean temperatures from climate model simulations are typically calculated using surface air temperatures, while the corresponding observations are based on a blend of air and sea surface temperatures. This work quantifies a systematic bias in model-observation comparisons arising from differential warming rates between sea surface temperatures and surface air temperatures over oceans. A further bias arises from the treatment of temperatures in regions where the sea ice boundary has changed. Applying the methodology of the HadCRUT4 record to climate model temperature fields accounts for 38% of the discrepancy in trend between models and observations over the period 1975-2014.